Life, Learning and Handheld Devices: Visual stimulation is a substitute for thought. Visual stimulation is a substitute for thought. 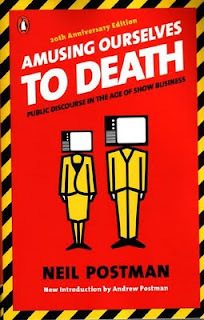 Neil Postmans "amusing our selves to death" from 1984 is an analysis of how TV changed us. Did TV really change fundamental aspects of our culture, and even shape the way we think ? I started asking myself that question after reading the first Chapters, and naturally went on to asking myself the following question. If TV had this impact on our culture and thinking - what about internet ? The book is written in a time close to the target year of George Orwells "1984". Orwell describes a society with all ingrediens of what we fear - totalitarism with full censorship and control of speech, information, and even the languare. Orwell's picture of 1984 is pretty far from what our democracies in the western world has become. In Aldous Huxleys "Brave new world", however he describes a a society where this is irrelevant, because people have entered a state of mind where they don't care; passive and occupied with trivialities. Huxleys concept is "What we love ruins us". Postman explores the possibility that we have entered a state that pretty much resemples Aldous Huxleys "Brave new world", and that TV plays an important role in it. Maybe internet is just an accelerating factor on top of TV ? or maybe not ? An average American spends 4.5 hrs in front of TV every day. Some numbers show that this have not changed a lot for many years, but in the keynote at Vizrt days in Bergen last week it was referred to a US study that showed 35% increase in average total time used on internet,tv and mobile together - a 35% increase in only one year ! Another interesting fact is that 35hrs of video content is uploaded to YouTube every minute. Why is TV such a revolutionary inventions that changes us ? The single most significant factor is the fact that it steals so much of our time. But the fact that TV is a media in itself and has become the key bearer of communications in out culture is also important. - We understand the world through TV. Marshall McLuhans idea that "The medium is the message" fundamental part of the reasoning. Just the very format of the medium TV lends itself to have a bias towards certain types of content - A story must be told in pictures. The format of a book favour other kinds of content. Exploting abstract ideas or having a discussion on philosophy is probabely easier in a book format based on written language than on TV. Hence the idea that the media shapes the content- We might have a perception that TV gives us all types of content: News, Entertainement, educational programmes etc. "Amusing our selves to death" suggest that most of this has an element of entertainement. "If it doesnt look good - its not good TV. Even politicians need to be good looking, or at least have a good apperance on TV. This is probabelty of more importance than their capabilities to talk and write. They have other people writing their speeches anyway, so in one sense they are also actors - reading a script. Another idea that is fundamental to Postmans analysis is that every tool or medium (or technology if you like) represents a methaphor that shapes the way we think and structure information. The best example of this is the clock. The clock itself is just a think we use to keep track of time, but in fact the closk introduced the very idea that time is something that can be sliced into small peaces, minutes , seconds and be measured. So the clock it self is more than just a thing it brings along methapor that shapes our conception of time. Form matters more than content. A joke or witty comment can make one person the winner of a debate. As a tv producer you would give prominence and precedence to any event that have visual documentation. Context is superfluous - a picture constitute a context by itself. Things does not have to be connected or relevant. No matter how serious (war , earthquake), it will be interrupter by a commercial in a newscast. Or the quick shift to something completely different - "And now this" - the sentence very often used by news presenters because things are not connected.This suggests that passive consumption of information is OK. All reports of cruelty and death is greatly exaggerated and in any case not to be taken seriously or responded to sanely.